Barge FC got back to winning ways in Division One of the Ziggy’s Metro Cars Halifax Sunday Football League, with a 3-1 defeat of Oddfellows, rendering last weekend’s loss against Queens Head a distant memory. Manager Matthew Bagshaw was delighted that all of his side delivered after proving disappointing in their last outing; although he praised Oddfellows for a resolute defensive display. That said, Rickie Earnshaw at centre back for Barge, also drew praise from his manager for a solid outing; while Andy Salm picked up man of the match in a central midfield role. Salm was amongst the goals in a 3-1 victory with Mike Woffenden and Jamie Cartledge also on the scoresheet. The victory has set the Brighouse side up nicely for an early top-ofthe-table clash when they face table-toppers Beehive & Crosskeys this weekend. 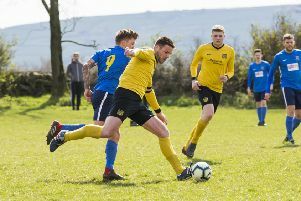 In the Premier Division, Old Pond continued their marked improvement after a very slow start to the season but, despite clinging to the coat-tails of a very skilful Halifax Hammers side, ran out of steam at Lane Head. The visitors took the lead when a Mohammed Ozair cross was headed home; but Pond rallied and James Broadbent latched on to captain Joe Shaw’s through ball to finish well. Dan Barnes had already saved well from Hammers front man Lamin Getteh; but the pacey front man was quickest to snap up a rebound and level. Once more Pond came back through Broadbent. However, the hard working forward linked up well with partner Wayne Allert throughout the match and scrambled the ball home after Jamie O’Callaghan’s shot was deflected into his path. The Hove Edge side were looking set to go into the interval level, but a great strike found the top corner just before the break to leave Richard Dawson’s side 3-2 behind. Pond started on the front foot in the second period and Broadbent was twice narrowly denied his hat-trick before Hammers match-winning players moved through the gears and took the game out of reach. Ozair and Matthew Waller in particular were a constant menace with their pace and skill, although Lee Williams was excellent at the back for Pond in repelling their attacks. Both got on the scoresheet, however, before a cameo from Hussain Farooq off the bench, who netted twice, contributed to an eventual 8-2 victory for the visitors. Top Club have also found points hard to come by following the difficult leap from Division One to Premier League and fell to 5-1 against FC Bowling Green. Top Club and Old Pond will contest a return derby next weekend at the Rastrick side’s new Carr Green home. Top Club’s Reserve side also tasted defeat at the hands of one of Division Two’s title favourites, King Cross Park. Matthew Evans’ charges also circumbed to a 5-1 loss on Savile Park. Crown FC had more luck as Ryan Collins was among the goals in a 4-2 win over North Bridge Reserves at Rastrick High School. The result will be a boost before they face league leaders Halifax Rangers this Sunday.